Review Summary: While Avenged Sevenfold have previously been able to overcome their weaknesses, the strongest moments on Nightmare aren't quite good enough to hide its flaws. If there's a grey area between solid return to form and stagnant mediocrity, this is more or less where Avenged Sevenfold hits the mark with Nightmare. Given the terrible rut the band worked themselves into on their self-titled record and the less than stellar "Nightmare" and "Buried Alive", previewed in the weeks leading up to the album's release, Nightmare's prospects didn't look good. But then again, even Avenged Sevenfold's good albums have unfortunate moments (the bro-downs in Sounding the Seventh Trumpet's "Thick and Thin", the mundane pace in Waking the Fallen's "Desecrate Through Reverence", the clumsy songwriting in City of Evil's "Betrayed"). 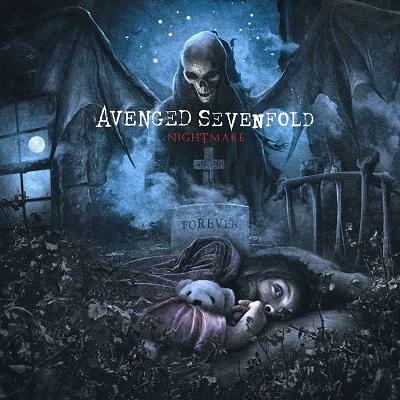 While they've previously been able to overcome their weaknesses, the strongest moments on Nightmare aren't quite good enough to hide Avenged Sevenfold's flaws. Nightmare isn't an easy album to dive into for two major reasons, both of which hold back several otherwise decent tracks. Avenged Sevenfold have always been at their best when they focus on playing infectious melodic metal (or metalcore), particularly through their utilization of Iron Maiden inspired guitar harmonies. The results are predictably less than adept when they get heavier. It's obvious that they love Pantera and Metallica, but the chunky, down-tuned groove riffs sounded terrible in the '90s, and sound terrible in "Nightmare", "Welcome to the Family", "Buried Alive", and especially "God Hates Us". It's a problem closely related to Nightmare's other huge issue: the album is too damn long. Or it feels that way at any rate; Nightmare's sixty-six minutes run shorter than both Waking the Fallen and City of Evil, and though the majority of the record's rockers are only around five minutes long, they do not flow as fluidly as they could. With the exception of "God Hates Us" and "Buried Alive", guitarists Synyster Gates and Zacky Vengeance do transition back into their melodic tendencies in choruses, instrumental breaks, and the like, making for a much more engaging listen. Granted, so long as you can make it through the poor attempts at groove influenced metal, that is. "God Hates Us" aside, the second half of Nightmare is where things get really interesting. Eschewing the sometimes noteworthy, sometimes half-baked metal sound established earlier, Avenged Sevenfold embrace both acoustic pieces and ballads alike. While the band's slower songs are usually hit or miss, ranging from great ("I Won't See You Tonight, Pt 1"), to the mediocre ("Warmness On the Soul"), to flat out awful ("Dear God"), they're excellent this time around. For an album plagued by macho metal posturing, it comes at a key moment. The Alice in Chains influenced "Tonight the World Dies" is especially notable, building its foundation on its heat-choked atmosphere rather than instrumental prowess. Between the piano heavy "Fiction", dark power-ballad "Victim", and stripped down "So Far Away", it's a much needed breath of fresh air. Perhaps the chief reason for Avenged Sevenfold's mini-resurgence is that they're actually inspired again. The most offensive aspect of their self-titled album was that it sounded like they weren't even trying, which was reflected in the record's atrocious output. Nightmare is a completely different offering; even though it still has highly questionable moments, it's obvious that a genuine effort was put in, and that's enough reason to listen. In a way, Nightmare is Avenged Sevenfold's most important record. It's as much closure for the group's surviving members as it is a dedication to The Rev after the drummer's untimely death. In this regard, it's a very respectable record. But at the same time, it just isn't as good as Waking the Fallen, City of Evil, or even Sounding the Seventh Trumpet, and whether it'll maintain the listening power that made those albums so good remains to be seen. best review wirtten for this album so far. best review written for this album so far. I love how this has 29 classic votes already. Album is probably bad but I'll dl anyway. I've got a soft spot for this band. Honestly I think Shadows' voice will turn me off of basically anything this band does. You didn't like God Hates Us? This is the review I agree with the most though, besides that. Cool review bro. I'm kind of stoked to hear this album, actually... been getting pretty nostalgic for a7x as of late. I'm not a huge fan of God Hates Us as well, screaming was meh. If anything about this album, the weakest thing about it is it's pacing. Spread the slower songs out, and you've got an album you can listen to in it's entirety and continually be kept on your toes. Im really suprised you didn't like welcome to the family. That lead guitar in the chorus is about as catchy and fun as I've ever heard. moreso even than anything on City of Evil, which pretty much was as catchy and fun as metal can be. I said I just don't like the way it starts. Otherwise it's pretty enjoyable for the reason you mentioned. It's obvious that they love Pantera and Metallica, but the chunky, down-tuned groove riffs sounded terrible in the '90s, and sound terrible in "Nightmare", "Welcome to the Family", "Buried Alive", and especially "God Hates Us". Wow, I completely disagree with that. But good review regardless. God Hates Us is one of the top 3 songs here. "Honestly I think Shadows' voice will turn me off of basically anything this band does." AMEN! God, I hate Shadows' voice. yeah balls, i gotta say, for some reason, i really enjoy buried alive and also god hates us. I keep picturing the skeletons head banging from their promo video when i hear it. It's silly i know, but i love it just for that reason. Regardless that our ratings are similar, I disagree with most of your points. Review was well written though. Good review. I really liked the album though.